An accord between utilities and automakers could set the stage for widespread electric vehicle adoption. A bank of Tesla Superchargers is pictured. 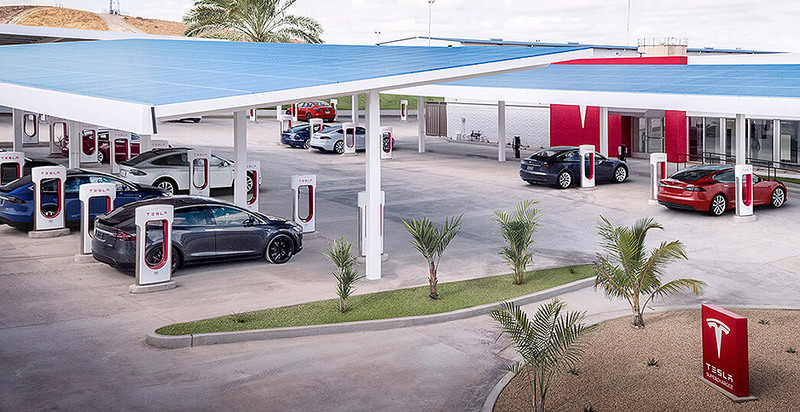 Tesla Inc.
General Motors, Honda and a who's who of the utility industry today embraced a common vision for how to charge the horde of electric cars rolling out in the next few years. But it is unclear whether automakers and power companies — two vast enterprises whose paths have rarely crossed — are on the same schedule, a worrisome sign for industrial giants that will need to align hand and glove for their many billions of dollars of investments to pay off. A GM official representing the new accord called the task "urgent," but a leading utility executive was much more circumspect. The Transportation Electrification Accord refers to itself as "roadmap to electrification" and envisions a future where utilities, regulators, governments, charging companies and automakers get behind a standardized, open system where electric vehicle (EV) charging is simple and everywhere. Many obstacles exist in a world where "automaker" and "electric utility" are rarely mentioned in the same breath. Automakers are counting on power companies to supply the infrastructure to charge the dozens of models of electric or plug-in hybrid cars they will debut in the next five years, but it's unclear whether utilities want to spend billions of dollars to build it. Conversations between the two are barely underway. The accord is "a blueprint that the various stakeholders can use to hopefully hold each other accountable," said Jack Gillis, the director of public affairs at the Consumer Federation of America. That the Consumer Federation, often a sworn enemy of the automakers, is on the same side as GM may be the sign of an historic alignment. Signers of the accord include major environmental groups, including the Sierra Club and the Natural Resources Defense Council (NRDC); major utilities, including Exelon Corp. and National Grid; the Edison Electric Institute, the trade organization of investor-owned power companies; growing EV-charging companies like Greenlots and EVBox; and two districts of a big union, the International Brotherhood of Electrical Workers. Environmentalists like EVs because they produce no climate-warming emissions. The Consumer Federation likes their low maintenance and fueling costs, while automakers are preparing their global fleets to meet rigorous EV goals in China. For utilities, the benefits include a major new user of electricity. The accord's language is nearly identical to the mission statement of another group, the Alliance for Transportation Electrification, founded last November. Its board includes senior officials from Southern Co., Duke Energy and Ameren, some of the largest utility companies in the South and Midwest. The loosely affiliated accord announced today said that the proposal started with several nonprofits that work at the intersection of environment and energy, including the Sierra Club, NRDC, Advanced Energy Economy and Illinois' Citizens Utility Board. The principles of today's agreement have long circulated among EV policy wonks but have never been saluted at this level. The accord says that heavy-duty vehicles, like freight trucks and buses, should be electrified along with passenger cars. Chargers should be available on highways and in cities. State and local officials, including regulators, need to get on board. Utilities, for their part, should take a lead in building charging infrastructure, including possibly owning it. The network ought to be designed to work in tandem with renewable energy and avoid congestion problems that arise when too many electric cars charge simultaneously. Finally, the accord states, EV chargers should work on common standards, and networks on a shared architecture, so that any driver can use any charger with minimal hassle. Two of the biggest players in the accord — GM and Exelon, one of the largest regulated utilities in the U.S. — espoused the ideas but with distinct degrees of fervor. "It is of primary importance. It is urgent," said Britta Gross of GM, speaking of the need to build EV charging infrastructure. "Scaling [of EVs] is going to happen really, really soon." Gross is director of advanced-vehicle commercialization at GM and a member of the Orlando Utilities Commission. Electric cars have become a cornerstone of a larger transformation at GM. Its signature battery electric car, the Bolt, is the platform of choice for other high-stakes ventures into self-driving and shared cars. The company said last week that it would ramp up production of the Bolt by the end of the year, the leading edge of a plan to introduce at least 20 new electric models globally by 2023. The Bolt will be the basis for the Cruise AV, a self-driving auto that GM wants to debut next year. Alongside that is a plan to turn that fleet of steering-wheel-less cars into an autonomous taxi service. The paucity of charging infrastructure, though, is most felt by Maven, GM's other sharing service, which makes cars available to Uber and Lyft drivers who don't own a car. At least 400 Bolts are part of the program. A lack of direct-current (DC) fast charging, which can enliven a battery in minutes rather than hours, is crimping the program in the nine cities Maven serves, including Los Angeles and Washington, D.C.
"These cities, we cannot expand our EV fleet until more fast-DC chargers show up," Gross said. Other participants in the ride-sharing space, such as Uber, have identified the lack of urban fast charging as an Achilles' heel (Energywire, June 11). "It's to say, this is no longer a guessing game of what needs to happen," Gross said. "Utilities must engage, and they must engage now." Chris Budzynski is the director of strategy and business development for Exelon, which owns utilities in Chicago and the Northeast. He expressed less urgency and more curiosity. "Anything that impacts our system we clearly want to understand it and know how it works and how it's going to interact with our system," he said of the utility's participation in the accord. He learned of the entity's existence at the annual meeting of the National Association of Regulatory Utility Commissioners last year. The business case for utilities to build EV charging networks is less clear than it is for GM. They are uncertain whether drivers will adopt electric cars en masse and don't want to be left with billions of dollars of stranded investments if they don't. Budzynski said that EVs have clear advantages for customers, including both those who drive the EVs and those who don't, who would benefit from the elimination of the toxic emissions from gas-powered cars. "There is clearly a benefit from a load perspective. We do own generation assets on the competitive side of our business," he said. Asked what the benefits would be for investors, he replied, "From a utility perspective, this would require some rate-base investment on our part." He also noted that regulators and legislatures, not utilities themselves, have been the driving force behind EV-charging investment so far.